I want to start this review by saying, "Thank you," to two people who will never read it: Jim Henson and David Bowie. I want to say, "Thank you," for the immeasurable joy they brought into my life. I want to say, "Thank you," for being two people who made the world better by being a part of it. Jim Henson's Labyrinth: The Board Game is terrible. In fact, I'd go further than that. I would say it's a failure. There's a difference between a terrible game and a failure of a game. Terrible games can be terrible while achieving exactly what they set out to do. Take Destination London, for example. That is still one of the worst games I've ever had the misfortune to play, but for all its faults, it still worked as intended. It's a roll and move family game designed to showcase areas around London and to serve as something for tourists to take home with them. Destination London is terrible, but I can't imagine anybody playing it was expecting anything more than what they got. The game aimed so low, it couldn't fail. And it even managed to win an award. Jim Henson's Labyrinth: The Board Game (hereafter referred to as Labyrinth to halve the word count for this article) is a completely different situation. Labyrinth is a straight-up failure. Not because it's terrible (which it is), but because it didn't have to be. It's a failure because it doesn't live up to its potential. And I know what you're thinking: "Of course it doesn't live up to its promise, it's a quick cash-in on a beloved movie designed to prey on fans." I know you're thinking that, because I was thinking it too. But I bought the game anyway. I bought it for the promise. I bought it because I wanted to believe that the Goblin King really would take me away - even just for a little while - to relive what I experienced the first time I ever saw Jim Henson's wonderful creatures doing the magic dance. Well, that and my wife is a huge fan of the movie, so I bought it for her; but I'm not going to let a little thing like the truth get in the way of a poignant statement. I admit, I was enamoured with the idea of a family game that we could play with our daughter, but I always had my misgivings. I just chose to ignore those misgivings, and instead get swept along with the idea that this really could be a little gem. Besides, there were glimmers of hope for me to cling on to. For a start, the playing pieces look gorgeous. The publisher employed a guy from Weta Workshop (yes, that one) to sculpt playing pieces for Hoggle, Sir Didymus, Ludo, Sarah, and The Goblin King. The results are really quite lovely, in an odd sort of way. The details are soft (we're not talking tabletop miniatures quality here), but they have a nice weight and feel, and their bases make them look like statues or... well... playing pieces. There's something very pleasing about their aesthetics. They emphasise you're playing a game, which in turn emphasises that feeling of childlike innocence and fun. The whole game is presented with loving care and attention. 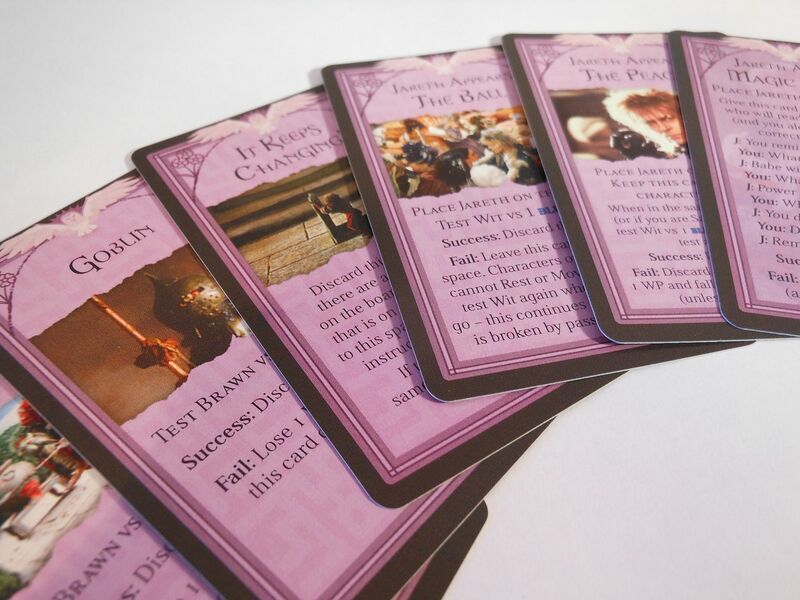 The four character cards for the heroes have nice hand-drawn illustrations, the deck of cards you draw from as you explore the labyrinth has stills from the movie (as you would expect), there's a wonderful turn tracker in the shape of Jareth's 13-hour clock, and standups for some of the more powerful enemies you meet on your journey. It's all housed in a felt-lined box insert, and there's a wonderful owl insignia reproduced through the cards and the box art that is going to instantly stand out to fans. The whole thing feels special in a way that many family games simply don't. It's not a game that was made. It's a game that was crafted. But it's the beautifully illustrated board that steals the show. 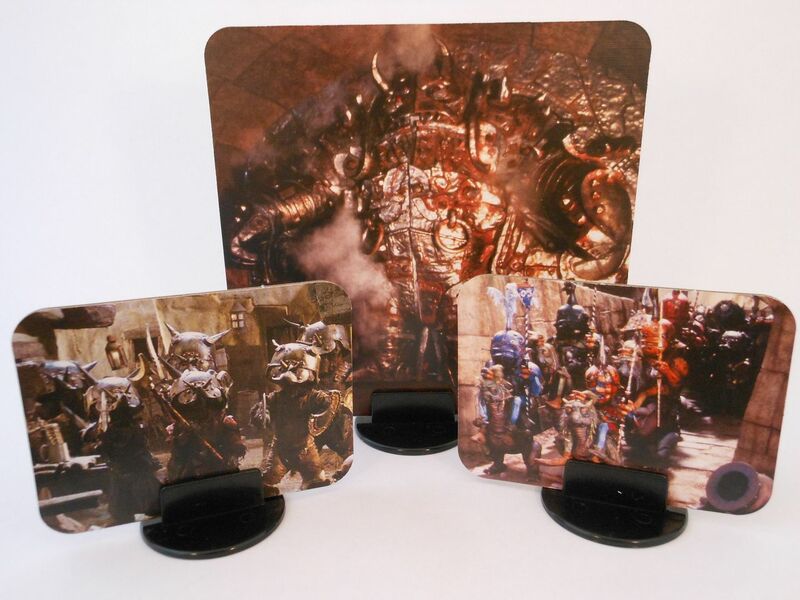 It was created by the same chap that sculpted the miniatures and drew the character art on the cards, and it's one of those boards you can stare at for hours. It lovingly recreates every major scene from the movie. Look here, and you'll see the Worm sitting on a wall ("Ello! "), and over there is the Firey Gang dancing around the forest. Squint and you'll find The Wiseman sitting in his garden, and if you look really, really carefully you'll see multiple instances of Jareth's face carved into walls or growing out of the foliage. Finding those faces is like a game in its own right. The board is such a special thing it's almost worth the price of admission alone, and when I discovered that the publisher was issuing a poster of the board art as a preorder bonus I was very happy. I was, of course, slightly less happy when I discovered the massive tools sent the poster folded into quarters, making it completely worthless as a display piece. So... Yeah... Thanks for that. In fact, the board makes something very clear. The artist has far more love for Labyrinth than designer Alessio Cavatore has. Oh yes, didn't I mention? The talented games designer Alessio Cavatore is responsible for spewing out this game. That's one of the biggest disappointments of all, because his name carries a lot of weight. He's worked on Warhammer Fantasy Battle, Warhammer 40,000, Lord of the Rings, Mordheim, Bolt Action, and Terminator Genisys. That's an impressive portfolio by anyone's standards. Of course, it's also a portfolio of tabletop miniatures games. Labyrinth is not a tabletop miniatures game. It's a family-friendly board game. It is, much like the movie it's based on, something to roll out on a rainy Sunday afternoon. However, unlike the movie it's based on, the Labyrinth game is toilet water. But it really shouldn't be. Despite being pitched as a family game, it draws very heavily on the classic adventure game Talisman. 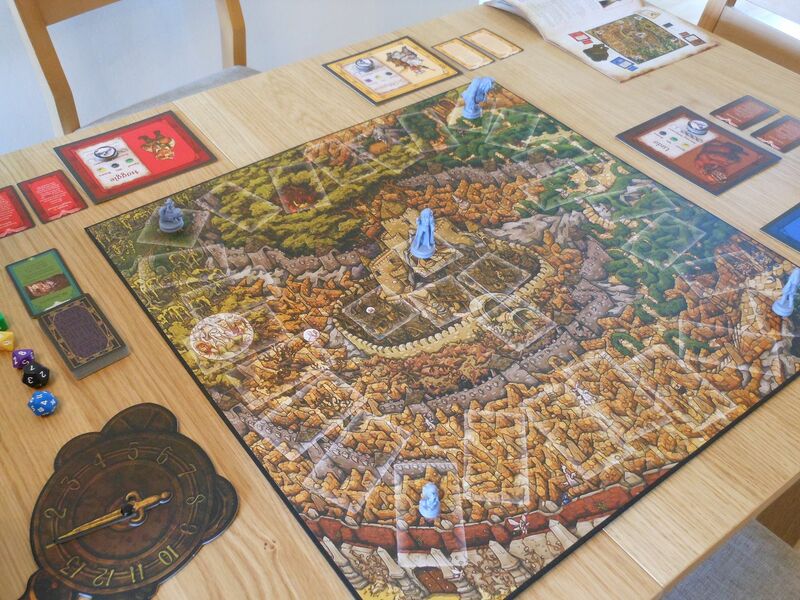 While Talisman, is far from the epitome of modern game design, it's certainly a long stride from more traditional fare such as Monopoly or Cluedo. If nothing else, it's a strong base on which to craft something new, taking those reliable if rather uninspired mechanisms and making them worthy of the Labyrinth name. There's certainly the potential for a solid gaming experience here, and at times Labyrinth does show evidence of what it could have been. I mean, it's basically just a roll-and-move game, with some push-your-luck mechanisms and a "doom track" that keeps the players under pressure and ensures no game is more than half an hour long. But swirled into the mix, there are signs that let you know there really was a world class designer at the helm. A designer that could have - and certainly should have - done better. So let's start at the beginning (unlike the game, which picks up the events of the movie at the point where Sarah has fallen into the Oubliette and Jareth has charged Hoggle with tricking her into going back to the start of the labyrinth). Right, I've got an issue with this. Labyrinth is most definitely not a game for one to five players. That's BS. It's a co-operative game for one to four players. And if I'm being honest, that's BS too. It's really a co-operative game for exactly four players. The introduction to the rules says as much: "Our game is developed for four people..."
So, why does the box say it's for one to five players? Because the rules include the most laughable set of variants I think I've ever seen. As a four-player game, it's fine. One player controls Sarah, one controls Ludo, one controls Sir Didymus, and one controls Hoggle. Fine. That makes sense. Four players; four characters. Everybody works together to beat Jareth, who teleports around the board based on adventure cards you draw during the game. So, how do the rules handle other player counts? With the tried and tested method of (and I'm sure you can guess) doing absolutely bugger all. 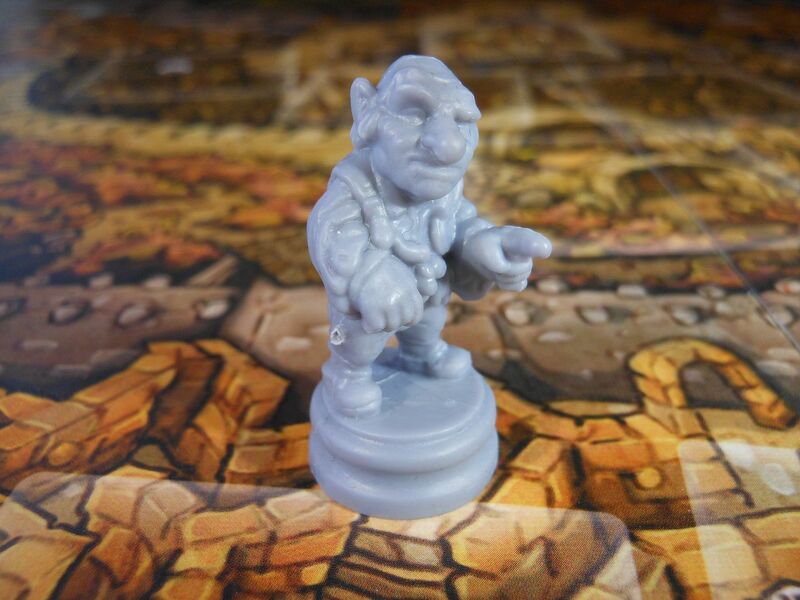 If you want to play solo, you control all four characters; if you have two players, you control two characters each; if you have three players one person controls Hoggle and Sir Didymus while the others get one character each. Oh this is the real kicker... When there are five players, one of them gets to BE Jareth. That's exciting right? Getting to BE the Goblin King? Well, hold that thought, because I'm getting ahead of myself here. You can't fully appreciate what a bloody awful proposition it is to play Jareth until you know exactly how the game works. It starts with the four characters in different corners of the board. They always start in the same corners: Sarah in the Oubliette, Hoggle at the entrance, Sir Didymus at the Bog of Eternal Stench, and Ludo in the hedge maze. Once you've positioned the playing pieces, you need to arrange the special dice nearby. The way the game uses dice is perhaps its most interesting element, although it's not unique as it's a system canibalised from Alessio's Terminator Genisys board game. Basically, there are different types of dice to reflect the attributes of the characters rather than giving attributes static numerical values. For example, Sarah who is quick-witted and fast, but not a strong fighter, has a Wit value of purple, meaning she gets to roll the 10-sided purple dice when making a Wit test, but her Brawn value is green, which means she only gets to roll the six-sided green dice when she gets involved in a fight. Conversely, Ludo is a beefcake who rolls a 12-sided black dice in combat, but only rolls a green six-sided dice for Wit tests. As tests always involve rolling a higher number than your opponent, it's obviously a good idea for characters to get involved in situations requiring tests they are more likely to overcome. It's actually a really rather lovely system, because you do feel empowered when you are rolling a strong dice against a weak one, and yet there is always a chance for the underdog to win. After sorting out the dice, you need to create the deck of Labyrinth cards. There are 32 cards in the deck, but at the start of each game you remove one card and put it back in the box, thus (and I quote the rules here) "making the game a little different every time." I am actually seething with anger, even as I type that line. I guess you can't argue with their definition of "a little different." Of the remaining 31 cards, one is the gate to the Goblin City, which is the one you are looking for as you roam around the labyrinth. The gate gets shuffled in with 10 random cards, and then you place the remaining 20 cards on top, so the one card you need is somewhere in the bottom third of the 31-card stack. Finally, you set the turn timer to 1 o'clock, and you're ready to begin. Hoggle goes first, and then play continues around the table with Sarah going last. 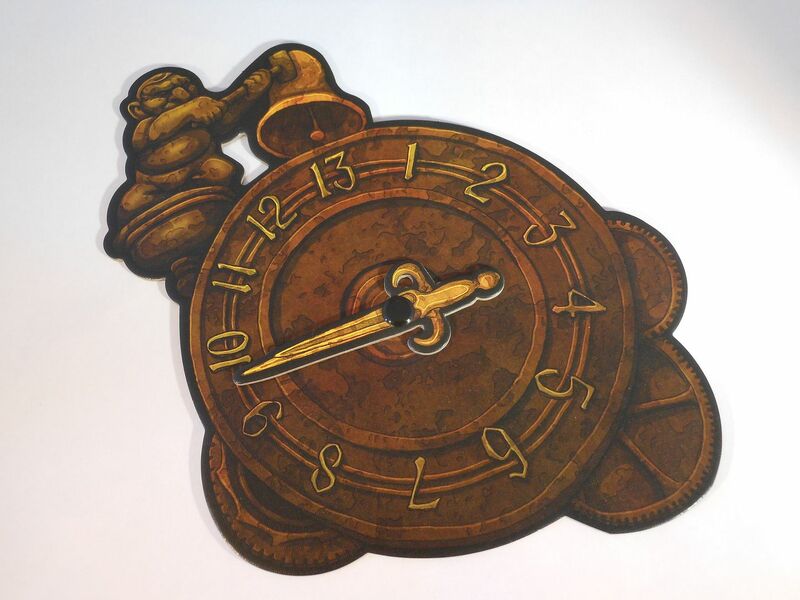 Every time Hoggle takes a turn, the clock advances one hour, and if the hand ever clicks back around to 1 o'clock, everybody loses. So, just like the film, the game is a race against time to get into the Goblin City and rescue baby Toby before he turns into one of Jareth's goblin minions. On your turn, you usually get to roll a dice to move. You look on your character sheet, and then use the dice related to your Speed value to move. Whatever number you roll, you have to move the full distance, moving either clockwise or anticlockwise around the board. And yes, those are the only two directions you can move. 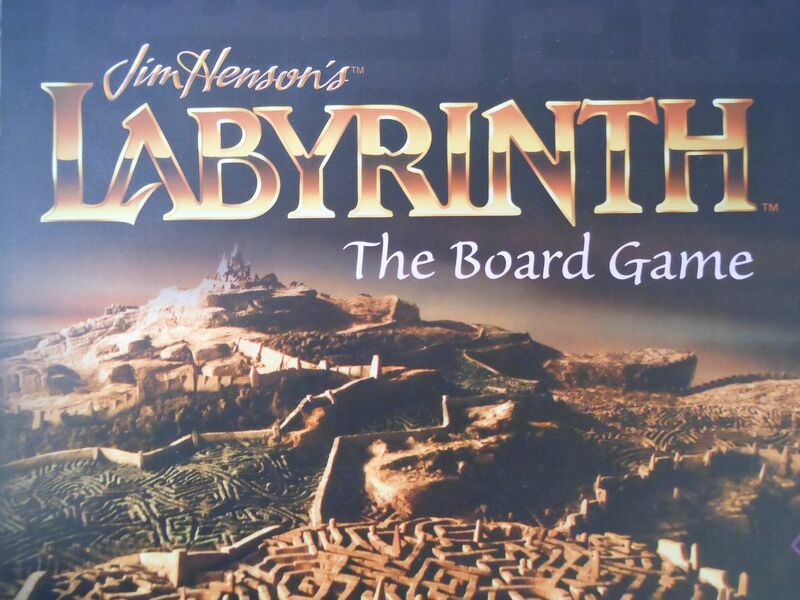 This game about a labyrinth, this game that's actually called Jim Henson's Labyrinth: The Board Game (except on the cover of the rules book, where it's called The Labyrinth, or in the introduction to the rules book, where it's called Labyrinth - the Boardgame, or on the back of the character cards, where it's called Jim Henson's Labyrinth), doesn't actually involve any kind of maze exploration at all. The entire experience of being lost in a labyrinth is abstracted into moving left or right around a perfectly circular route. 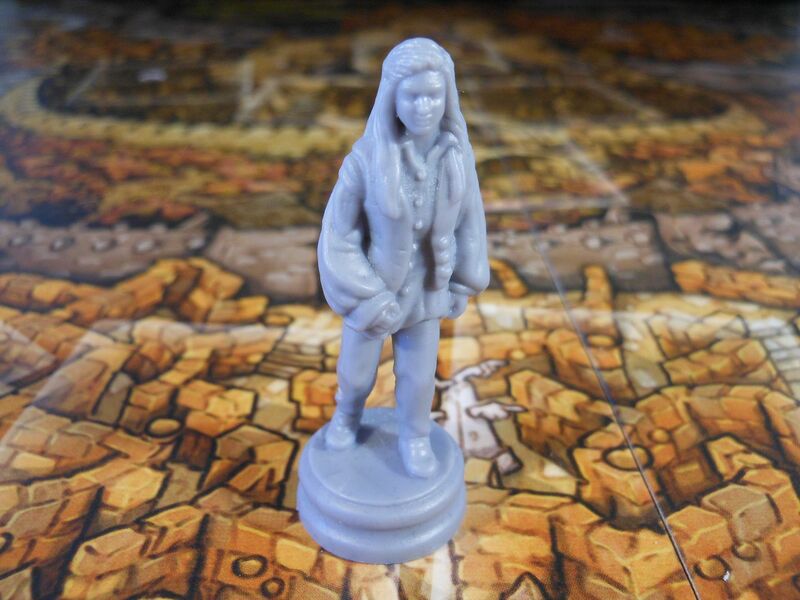 I suppose you could argue that the circular route around the game board accurately recreates Sarah's first experience in the labyrinth, endlessly walking the same path until the Worm ("Ello!") helps her out. I mean, you could. But that wouldn't make the experience any more fun. At least moving gives you a small choice to make. While you normally roll the dice associated with your Speed attribute, you are allowed to roll any dice that is weaker than your Speed. This represents you choosing to move more cautiously, or travelling at a slower pace to allow your slower allies to keep up with you. It's a nice addition to a basic roll-and-move mechanism, and mitigates some of the aggravation associated with always having to move the full distance shown on the dice. For example, if you normally roll a 10-sided dice for movement, and you are only one space away from the spot you want to land on, you can choose to roll the four-sided dice instead, giving you a much better chance of getting the result you need. And that may not sound like much when you read it, but it's one of those rules... one of those little touches... that reminds you Alessio Cavatore knows what he's up to. What happens after you move depends on the type of space you land on. Most commonly, you're going to land on an empty space, which means you get to draw the top card from the labyrinth deck and do what it says. This usually involves some kind of test. For example, you may need to make a Brawn test to fight a goblin, or make a Wit test to overcome a trap. During these tests, any other player at the table rolls for the enemy (using whichever dice the card specifies), and then you roll to see if you beat that score. While all the cards are very attractive, with cute stills from the movie, I can't say I'm particularly impressed with the way in which so many events from the movies are distilled into an opposed dice roll without any decision-making or strategy, or even any way to modify the dice results. Need to outwit the door knockers? Make a Wit test. Need to fight some goblins? Make a Brawn test. It's just so... uninspired. But there are some fun variations on the theme. For example, in some cases you get to decide whether you're going to attempt to outwit an opponent (with a Wit test) or fight them (with a Brawn test), giving you a chance to play to your strengths and improve your chances of success. There are also a few cards like "The Worm" ("Ello!") that you get to keep and cash in later on for a one-time benefit. Oh, and then there are the "Jareth Appears" cards. They're pretty much the same as the others, but they also move the Jareth miniature to your space on the board. The Jareth figure is effectively a road block, stopping any other characters from landing on that space until he moves. I don't want to go into spoiler territory too much here, but I do want to mention that two of the "Jareth Appears" cards offer the very best and very worst thematic implementations that this game has to offer. The best is "The Peach." Jareth appears and gives you a peach (and you keep the card as a reminder). The next time you land on the same space as Sarah, you make a Wit test, and if you fail Sarah loses some willpower and falls asleep, missing her next turn. Apart from the bit about missing a go, an archaic mechanism that rears its head all too often in this particular game, I think "The Peach" is something of a masterclass in good thematic integration. It's really rather nice, and representative of what I would have liked to have seen more of. Oh, and don't worry, you're going to be hearing a lot more about what I would have liked to have seen more of before this review is over. The worst "Jareth Appears" card is "Magic Dance." This particular card eschews the traditional test in favour of asking the player to recite the opening lines of the song from the movie. This is cringeworthy on a toe-curling level. It doesn't even make for good gameplay, because fans of the movie are going to know those lyrics off by heart so are never going to fail. Even the few people who don't know the song are going to know the answer after the first time this card pops up in play, so for any future games you might as well toss that card in the bin for all the challenge and entertainment it's going to provide. Anyway, that's basically how a turn plays out. You move to an empty space, draw a card, and then overcome the challenge the card presents (which in most cases is a growing sense of ennui). Failure usually results in the loss of willpower points, which you can only replenish by resting on your turn (in other words, missing a go); and if at any point you run out of willpower, you get sent to the Oubliette where you have to miss a go (yay!) and then probably miss a few more goes trying to replenish some of your lost willpower (yay again!). If you really feel you need to pass a test, you can pay a willpower point to try again, but using the awesome 20-sided blue dice instead of your regular dice. Of course, if you fail, you still suffer the original penalty but you've ended up losing even more willpower in the process. 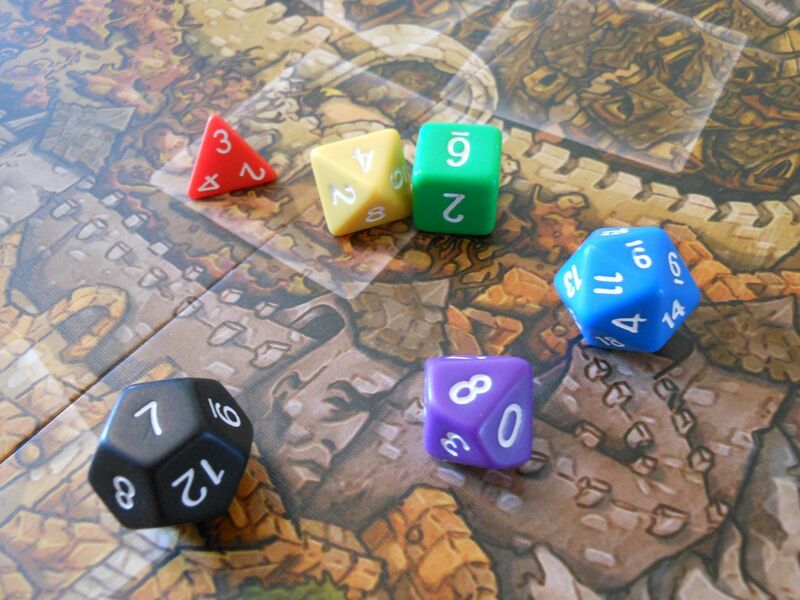 If you are really having trouble with a challenge, each character also has a single-use special ability that allows them to retake a test using the 20-sided blue dice without spending any additional willpower. Sarah and Hoggle get to do this for Wit tests, while Ludo and Sir Didymus get to do this for Brawn tests. Success, on the other hand, usually results in... well... nothing, actually. In a rather miserable twist, overcoming the challenges doesn't really give you any benefit at all other than preventing the loss of willpower. Whether you succeed or not, often the card remains on the space; and if you ever return to that location you have to take the damned test again. In theory, that's not a bad idea: Over time you build a unique labyrinth, and it becomes more difficult to land on the empty spaces that allow you to draw from the deck and get closer to finding the gate to the Goblin City. In practice, it just makes the game less interesting as you are forced to land on the same locations, taking the same tests and facing the same consequences over and over again. It wouldn't be so bad if succeeding gave you some kind of benefit, but it really doesn't. This isn't a game about levelling up, or gaining new skills and attributes. You won't find useful items that make you a better fighter; you won't learn arcane lore that helps you outwit your enemies. The only nod to the traditional roleplaying-style advances you might normally expect are the optional "Weakness cards." There's one "Weakness card" for each character, representing a thematic character flaw they must overcome. 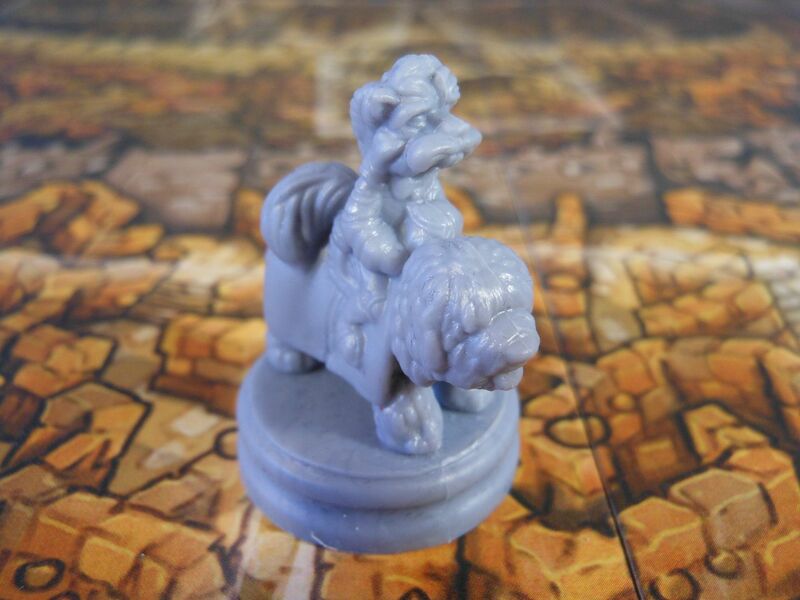 For example, Sir Didymus must convince Ambrosius to stop running away from a fight, so at the start of the game he only gets to roll a yellow dice in Brawn tests. 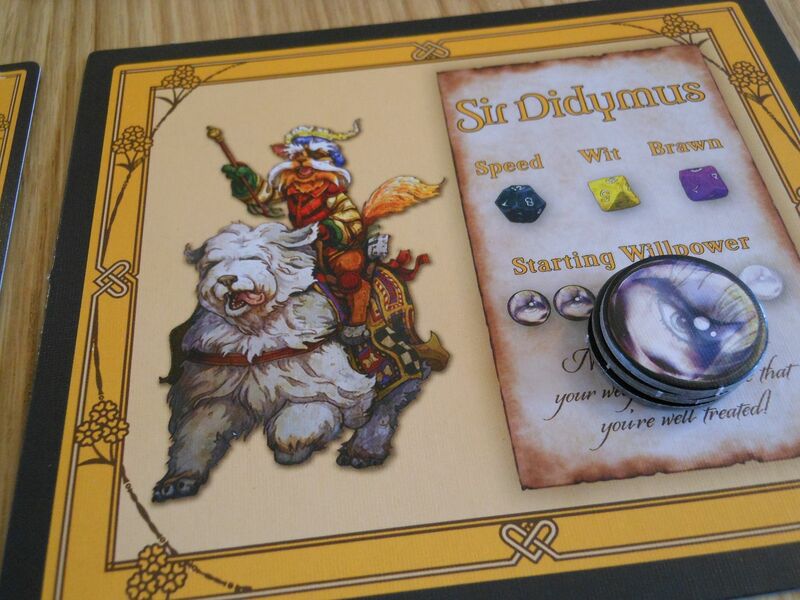 However, the first time he passes a Brawn test, the "Weakness card" gets discarded, and from then on Sir Didymus gets to use his regular purple dice. The other weaknesses are handled in exactly the same way, with Hoggle learning to stand up to Jareth, Ludo learning not to be afraid, and Sarah learning not to be such a whiny brat. There are really only two other things of note when moving around the board: Special spaces, and travelling in groups. Travelling in groups is another bit of game design dun rite. At the start of the game, the four characters are separated, moving around the board independently. However, once characters land on the same space, they have the chance to move together in future turns. The benefit of moving as a group is that the friends get to support each other. They can share their willpower tokens, representing the way in which they encourage each other to overcome great hardships; but even better, all the characters get to take part in challenges (each character rolls, and then you pick the highest result). Being in a large group is incredibly powerful, and you are unlikely to fail any challenges; but being in a group isn't always the best thing. A few events are specifically designed to screw groups (like "The Peach"), and if a group fails a challenge, everybody suffers the consequences. More importantly, being in a group means when you move you are only allowed to roll the dice of the slowest person in the group. The slow pace, combined with an inability to cover as many spaces in a turn as you could when you are split up, makes it difficult to reach the Goblin City in time. And that's fun. It's interesting to figure out when you should team up to beat a challenge and when you should go it alone for speed. Why doesn't the game have more of this sort of thing? Moving in a group is also more of a problem if someone has fallen into the Bog of Eternal Stench. The Bog of Eternal Stench. It's one of the greatest concepts in the movie. It's a wonderful and mysterious threat that hangs over the labyrinth like a wretched fug; a terrifying yet non-lethal punishment that Jareth uses to torture Hoggle at every turn; and a great excuse for getting as many fart noises into a kid's movie as feasibly possible without seeming crass. Here, the Bog is just a special space on the board. When you land on it you roll your Speed dice, and if you roll a 1 or 2, you fall in and get a "Smell Bad" token. From then on, you only get a 50 percent chance of being able to move as part of a group, because you are so embarrassed about how bad you stink. The other special space on the board is the Oubliette. If you land on it, you get to miss a turn. Eventually, as you explore the labyrinth, you'll uncover the gate to the Goblin City. This allows you to move to the centre of the board where you face a series of challenges based on the final scenes of the movie. You make a Brawn test against Humongous, then you make Brawn tests against goblin infantry, goblin cavalry, and goblin artillery. Finally, Sarah (alone) has to face Jareth with a dramatic Wit-based dice off. If Sarah wins, her final challenge is to recite the famous line from the movie that overpowers the Goblin King. I have absolutely no idea what's supposed to happen if she gets it wrong, because the rules don't say; and the game includes a card with the lines on that you can just read if you want to anyway. Then everybody does a magic dance and puts the game away. And that's your lot: A rather bland roll-and-move game with a few dashes of inspiration and bloody lovely presentation. Now, I'm not stupid. I know the game is intended to be a simple experience. But I can't help feeling like the game's being cynical, using the shield of "family-friendly" as a way to deflect accusations of lazy design, and the sword of nostalgia to cut corners. You didn't think I'd forgotten about that, did you? Really, this game isn't working on the basis of, "If it ain't broke, don't fix it." It's working on the basis of, "If we don't add it, it can't break." I mean, Christ on a bicycle. Really? You couldn't have given Jareth a limited supply of magic crystals that allowed him to use special one-off powers? You couldn't allow him to rearrange the labyrinth? Or play with the clock that counts down to the heroes losing? And it's not like this lack of imagination only extends to the five-player mode (and I swear I was almost sick writing about a "lack of imagination" in a review of a game based on one of the most imaginative stories ever committed to film). Why don't the characters have special powers? Why can't you level up your characters? Why can't Ludo call the rocks? The rocks just don't feature in the game at all. A lipstick for Sarah with a finite number of uses for avoiding dangers in the labyrinth, but with a card in the deck that would activate if she's used the lipstick, forcing her to shuffle cards from the board back into the deck. A plastic bracelet for Hoggle that would boost his Wit unless in a confrontation with Jareth. The ability for Ludo to call the rocks. The ability for Sir Didymus to ignore the Bog of Eternal Stench and all "Smell Bad" tokens. A whole heck of a lot more labyrinth cards to ensure you face new challenges in every game. A way to move between cards on the board so you aren't always following a circular route. I could go on, but I feel like I've already gone on long enough; and honestly, maybe none of our ideas would make for a good gaming experience. But the fact we could come up with so many ways to take elements from the movie and incorporate them into the rules... Well. You have to wonder. Why didn't the designer do that too? And you know what? I'm being unfair. I know I'm being unfair because the game looks beautiful and my wife intends to keep it and cherish it forever. And Yes, I've already ordered the Goblins expansion for her because she wants the cute goblin miniatures. And yes, I know I'm being unfair, because my daughter loves this game. She's six years old, and she always wants to be Ludo. She loves exploring the labyrinth, meeting all the funny creatures, rolling the dice, and saving the day. Most of all, she loves that we get to do that as a family. This is, honestly, one of the most accessible and easy to play co-operative games on the market. It's even easier to teach and play than Forbidden Island. That has to count for something right? I don't feel like being charitable. I feel like being unfair. I feel like letting my own love for the movie cloud this review. After all, why shouldn't I? The publishers played on that love when they launched this game, and now they have to accept the consequences. This game is not a fitting tribute for Jim Henson's legacy, and that's not fair; so I won't be fair either. But I'm not mad. I'm not angry. I feel let down, because Labyrinth the game is a failure. Labyrinth the movie is about growing up without growing cynical. It's a story about how to become an adult without forgetting how to be a child. It's about learning how to be responsible without ever giving up your sense of childlike wonder and imagination. Labyrinth the game just feels cynical. It fails to understand the difference between playing on nostalgia and evoking a real sense of childish joy. It can't tell the difference between hearing a line from a movie and making someone feel the way they felt when they first heard those words. It doesn't know that sprinkling around a few pieces of dialogue and a few recognisable characters isn't the same thing as creating a living, breathing world. And it never, not once, made me shed my adult cynicism. It never made me overlook its flaws as a game so that I could just have fun. It never let me recapture that feeling of being 10 years old, and wishing the Goblin King really would take me away - even just for a little while - so I could magic dance with all the other goblins. 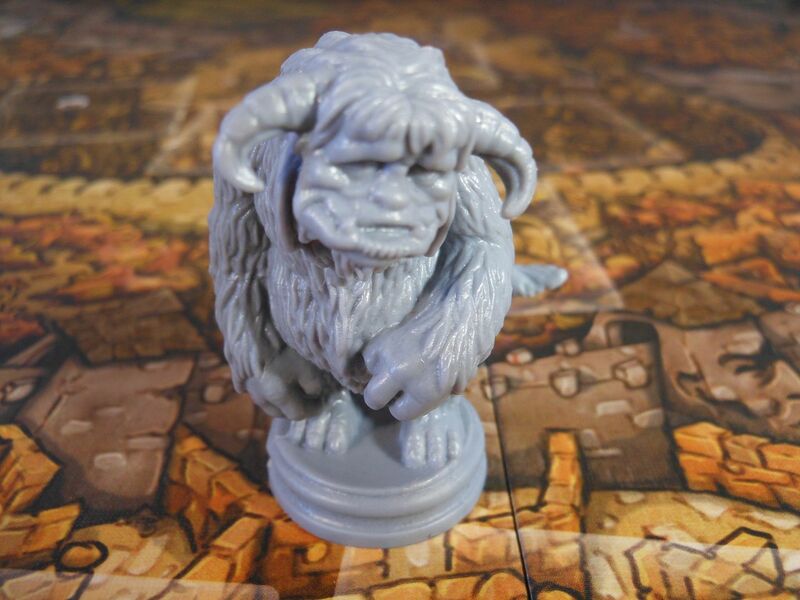 Jim Henson's Labyrinth is available online from good board game stockists. The Goblins expansion is due out late 2017. If you enjoyed this review, please consider visiting my Patreon page and making a donation to help me increase the number of reviews I can publish each month. A $1 pledge grants access to exclusive content you won't find here on the blog. Fantastic review, I've had the misfortune to play this game twice now and it really is awful. I initially tried to give the creators the benefit of the doubt and thought well it's an '80's film, they've purposely given it 80's board game gameplay but I quickly realised i was being way too kind. Like you've said this is a missed opportunity and just feels like a cynical cash-in that hopes the people buying it are nostalgic fans of the film who are oblivious to the advances in gaming over the last 30 years. I do feel they used the excuse of it being a family game to make something too simple. Even a few extra twists would have helped, and the small glimmers of interesting ideas (group movement, choosing which dice to roll when moving) shows that the designer is more than capable of making something much better than this. It's a lovely presentation, and a nice collector's item; but as a game it fails. 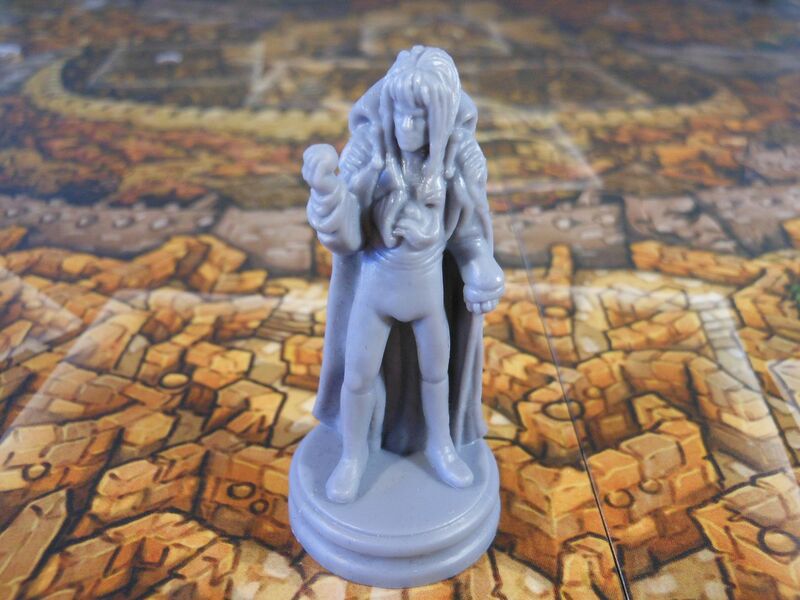 I'm probably going to use the miniatures in games of The Amazing Labyrinth, which is a much better family game.